Greek premier seeks lawmakers’ support for a deal that is tougher than the one rejected in referendum. Now comes the hard part for Greece Prime Minister Alexi Tsipras: selling a new bailout deal at home that is substantially tougher than the one he and Greek voters resoundingly rejected just a week ago. Greeks gave a mixed reaction Monday to news that Mr. Tsipras had reached a deal with lenders that includes punishing austerity measures that go far beyond the ones overwhelmingly rejected in a July 5 referendum. 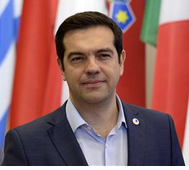 Mr. Tsipras now finds himself in a surreal position politically. The new deal —in which Greece would receive bailout money totaling up to €86 billion ($96 billion) in exchange for heavily opposed reforms such as pension cuts and VAT hikes—represents a spectacular U-turn for Mr. Tsipras, who was swept into office in January on an antiausterity platform. Now, he must back tougher versions of the measures he has vehemently disavowed for months. And to get the new package through Greece’s parliament by Wednesday, as required by Greece’s creditors, he must rely on backing from political opponents, rather than his own left-wing Syriza party. This decision is likely to test his coalition government, consisting of Syriza and right-wing party Independent Greeks. Mr. Tsipras needs to bond with his opponents because over the weekend 17 of the coalition’s lawmakers refused to back Greece’s bid to negotiate a new deal with lenders. “Tsipras will now come under immense pressure domestically as he looks to legislate this deal,” said Eurasia Group in a note. Among the options available to the Greek premier is to reshuffle his cabinet and demand defectors resign; form a new coalition government with centrists To Potami and socialists Pasok; or form a broader coalition of parties, like a national unity government, which would help him pass measures, added Eurasia. The new deal sparked bewilderment and some anger on the streets of Athens over the idea of further austerity in a country that has labored mightily under previous belt-tightening measures.